or just for creating your very own artwork. the class to enter the Giveway)!!! 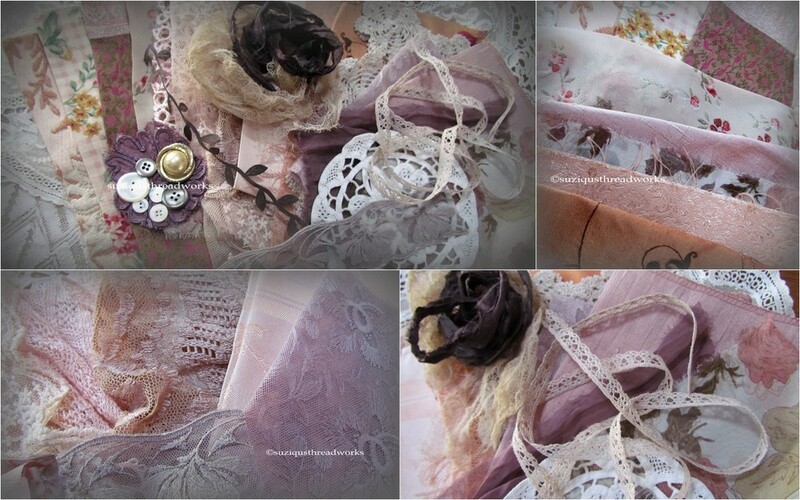 of a dyed lace flower, mop buttons and a piece of jewellery. kits which will be in my Etsy shop soon! as it's always nice to share a chance to win a Giveaway! hey??? Remember to follow to be in for a win! 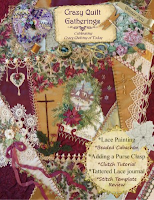 Labels: Fabric Lace Book / Journal "Peaceful and Ponderiing"., Giveaway -Fabric, lace and embellishment kit. Your book is fabulous and your giveaway is just "delicious"!! WOW! Now that's pure eye candy. Thank you for the wonderful generous opportunity. Best of luck on your venture into classes. Oh, thank you for the opportunity to win a generous the candy, Suzy! 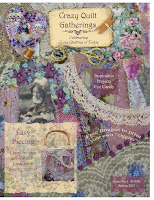 I love style "fabric vintage" and some do myself working in this style, so your kit would be very helpful. I hope this is not just Australia. I have trouble with English, I do not really understand the address, so I write the address of the site http://irinar2709.blogspot.ru/(which is placed a banner on the left the panels) and e-mail address irinar-scrap@mail.ru. This is an awesome opportunity for someone to win and hopefully attend your class in September, I know I am looking forward to it, as I know others will as well. 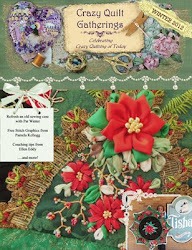 The colours of the giveaway are beautifull, lots to play with and the different combinations of patterns and textures, just go really well together. 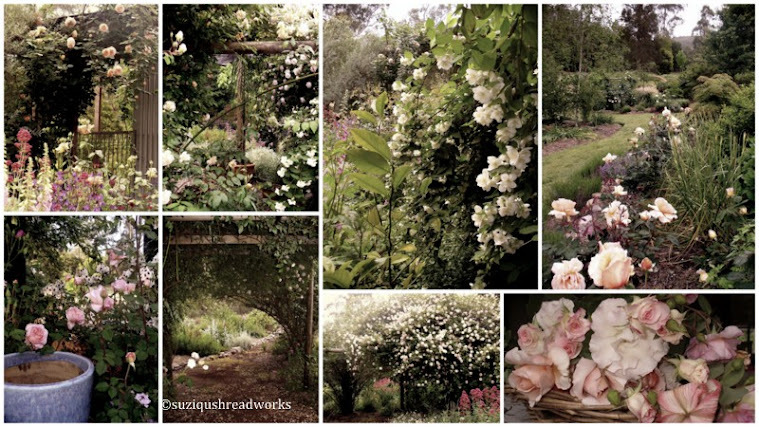 What a wonderful and inspiring blog. I have a collection of laces but most are not vintage unfortunately. Would love to win the giveaway and would be happy if I could create something half as lovely as the beautiful things you create. Thank You for this lovely chance to be a part of your creative journey. Although I cannot attend your class I would love the opportunity to win this sampling of your creative style. I have been following your blog for some time and would welcome the chance to play with these lovely things. I admire your works, a long time. I live in Romania and I am excited about this generous giveaway. I signed up for your class as soon as I could - so excited. Wonderful give away to kick start the class. Thanks so much..
Beautiful Giveaway Suzy. 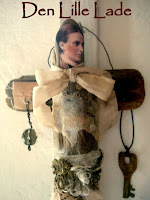 Someone will be very blessed to receive your stunning work and generous gift. I'm having a giveaway too if you'd like to enter. Looks like a wonderful give away. thanks for the opportunity to win! Congratulations on your store! What a beautiful kit for your giveaway. Someone is going to be very lucky to win this giveaway. Best do luck with your store. Thank you for the opportunity to be included in your gorgeous giveaway. I just love all of your work. Pat. it is such a lovely giveaway and thank you for the chance to take part. What a beautiful and generous giveaway, Suzy! Thanks so much for a chance to win. be still my beating heart...gorgeous and generous...love it! Dear Suzy, whomever is the lucky one, winning this amazing bunch of beautiful fabrics,laces and more, will be singing the rest day , being so exited to be able to work with so much beauty .How generous a give away my friend !! I will add you ,at once, to my sidebar sweet friend. I absolutely love reading and viewing each of your blog posts and admire your talent for creating beautiful art pieces; Each is a work of beauty and elegance. Thank you for that. I would love to be included in your Monday, 17th of August draw. I know it will be a success as those who follow you must all love what you do and would appreciate your kindness. I'm so excited about the class and am just waiting to get paid to sign up for it. I so enjoy seeing your work. Thanks for this chance to win! 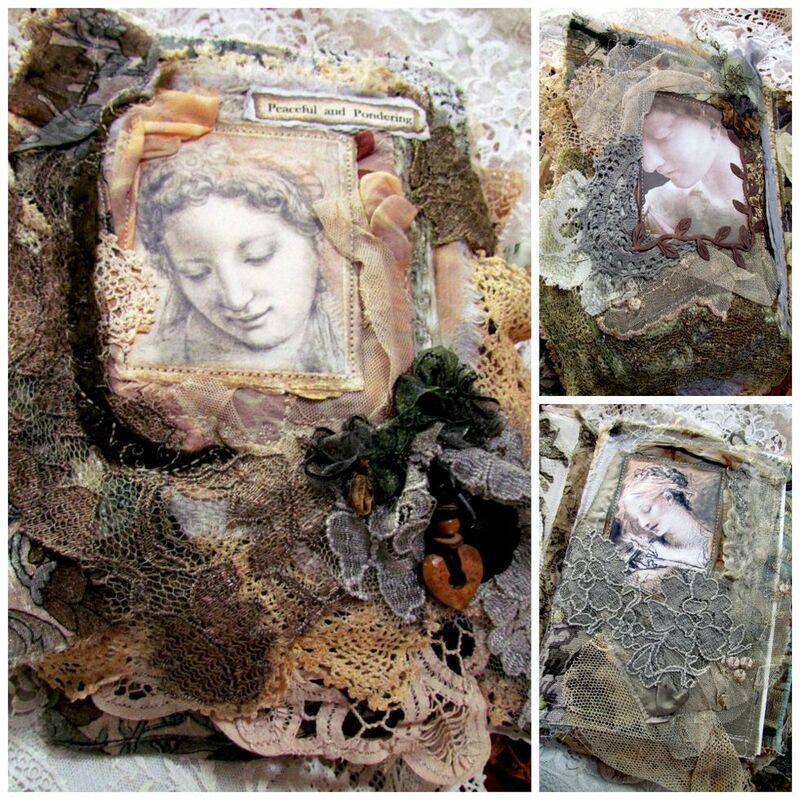 I admire your absolutely stunning art work and am so happy that you have offered an on-line class to teach your Fabric and Lace Journal/Book. I have purchased your class and will be creating my book entitled "She Longed to Dance" with a pink ballet theme. Your fabric, lace and embellishment kit would be a God send to receive. Your taste in fabrics and lace is humbling. I am counting the days until your class. Anyway... I am thrilled to be a long time 'follower'... I even have your button on my blog as 'Suzy Q my Muse'... as always, I love your work and am always, always so inspired by your creativity. This selection of items for your giveaway is quite delicious! I'm off to check into your course description and info. Just the thought of winning such pretties gives me goosebumps! Can't resist adding my name to the hat....thank you. Count me in. I have a collection started already. Suzy: You create such lovely embellished books! I would love to win your special gift of embellishments. I would probably want to take your online class for sure if I won them! This is really a lovely assortment of goodies. How very nice. Beautiful books and a great giveaway. I hope I can be that creative. Good success on the class Suzi; what a lot of hard work and fabulous results. Your giveaway is lovely, as are you. Beautiful giveaway. Your creations are so gorgeous. баннер на панеле справа. Алла. What an over-the-top generous giveaway, Suzy. I would be HONORED to have some of your bits and pieces! Thank you for the chance. I am late as usual, head down in the studio!! What a lovely giveaway.. Here I am again in your comment section hopefully filling out things just as I should be! There is nothing I enjoy more than being creative and expressing that creativity with needle and thread is one of my very favorite! I do so admire your charts and the through business you have given great beauty to so many. 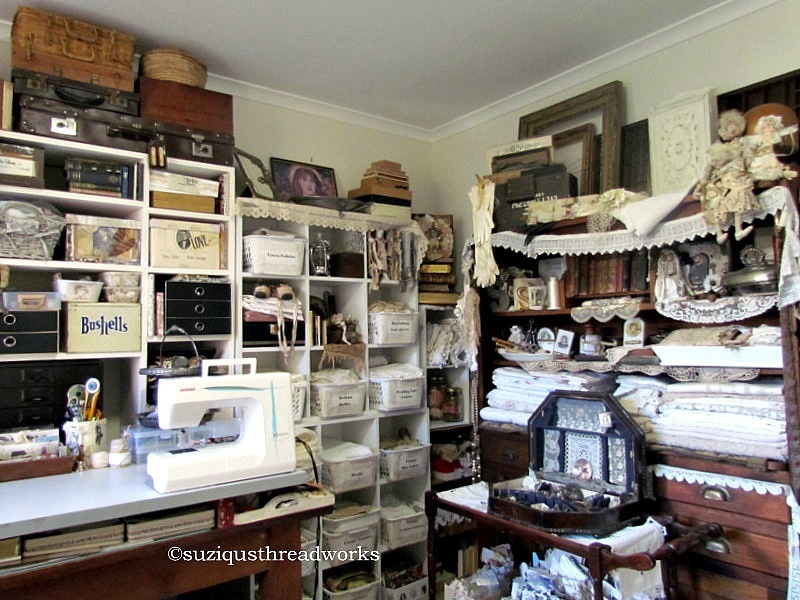 I would dearly love to add your collection to my sewing experiences! Thank you again. I HAVE BEEN FOLLOWING YOU FOR A COUPLE YEARS, YOU ARE AN AMAZING ARTIST. SO HAPPY YOU ARE GIVING AN ONLINE CLASS. I AM LOOKING FORWARD TO TAKING THIS CLASS. What a beauiful and generous giveaway,dear Suzy. Thanks for the chance. 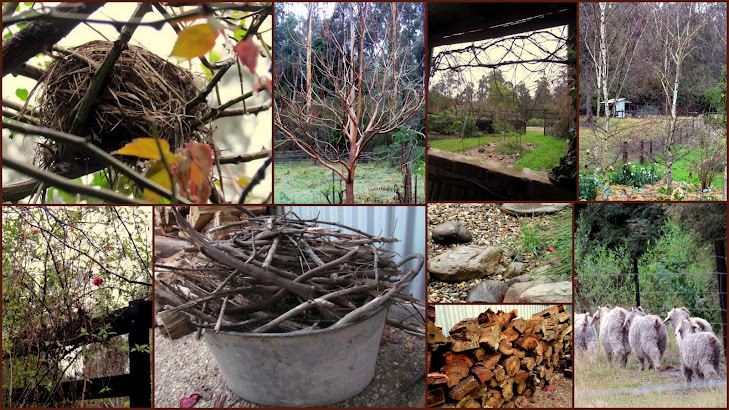 Something tugged at my heart strings and led me to come to your blog today. I have definitely signed up for your workshop. Just waiting for Gail to issue me a password and send info via email. Thank you for this sweet giveaway, and I am in ecstasy dreaming about creating your 'Peaceful and Pondering' fabric and embellishment journal. The giveaway (swoon! )is full of richness. Blessings to you this day and over the weekend. 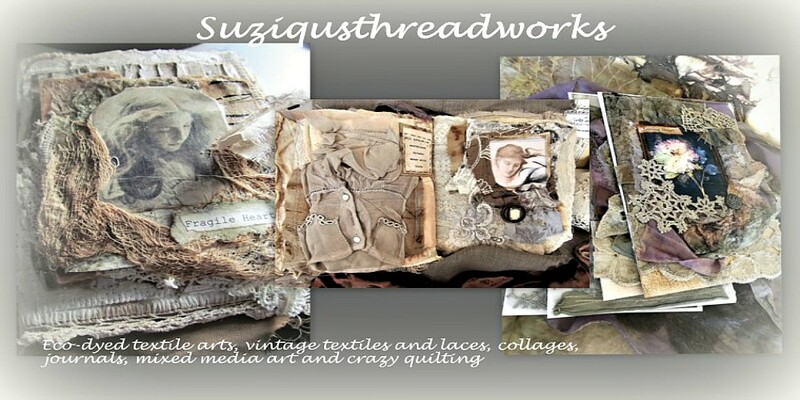 Hello Suzy, I am looking forward to taking your class and I would love to be entered into the beautiful giveaway. Thank you. Lovely! I adore the look of lace and can't get enough of it when it's used right like how you have used it! Truly beautiful! What a gorgeous giveaway. I want to wish you the best on your class. I know it will be a success! Your artwork is amazing! 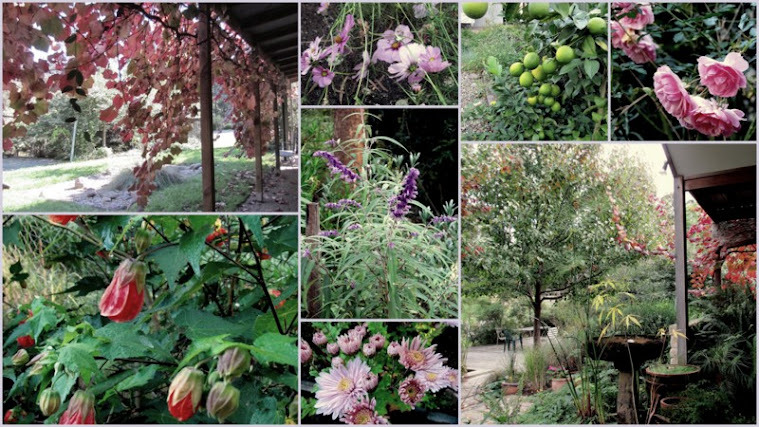 Your blog is always a feast for the eyes and sole,thank you. Thank you for the opportunity to win. 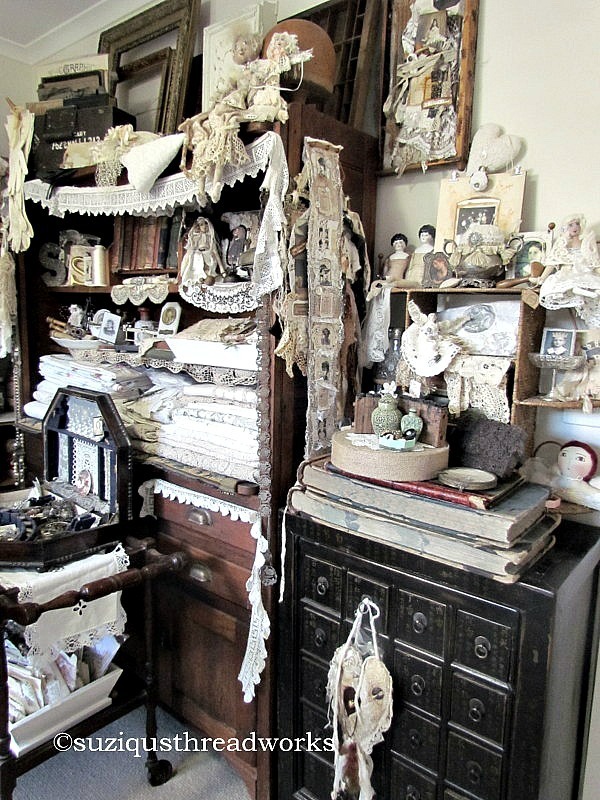 Love lace and fiber art.